BMW and TVS signed a partnership to manufacture sub-500cc bikes in India in 2013. The BMW G 310 R and the G 310 GS are exported to over 90 countries. Production of the BMW G 310 duo began in December 2016. BMW Motorrad rolled out its 50,000th G 310 motorcycle from its manufacturing facility in India. 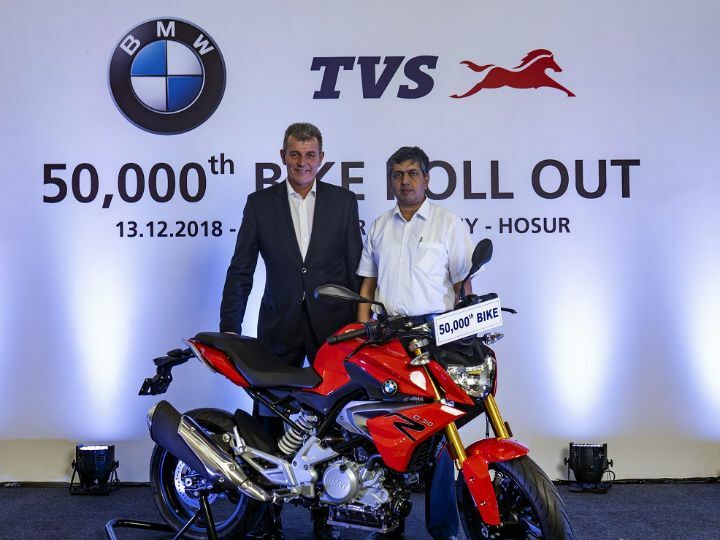 The 50,000th BMW bike to roll out was a BMW G 310 R in the presence of Markus Schramm, head of BMW Motorrad, and KN Radhakrishnan, director & CEO, TVS Motor Company. The BMW G 310 twins were the result of a partnership signed by the Indian brand with the German bikemaker in 2013 to produce sub-500cc bikes in India. While the BMW G 310 R and the G 310 GS were developed and designed in Germany, both the bikes are being built by TVS at its production facility in Hosur. TVS also benefited from this agreement as it launched the Apache RR 310 last year, which is its flagship offering. Exports of both the BMW motorcycles started in December 2016. However, the G 310 duo went on sale in India earlier this year. The delay was due to the brand's intention to focus on the European markets initially and also because it wanted to expand its dealership network in India. Despite the fact that both the motorcycles are manufactured in India, BMW did raise many eyebrows when it launched the G 310 R at Rs 2.99 lakh and the G 310 GS at Rs 3.49 lakh (both prices are ex-showroom Delhi). As expected, sales for both the bikes have been slow, given the high asking price. In fact, a few BMW dealers have started offering massive discounts in a bid to increase sales. The BMW G 310 R and the G 310 GS are currently exported to over 90 countries from India.